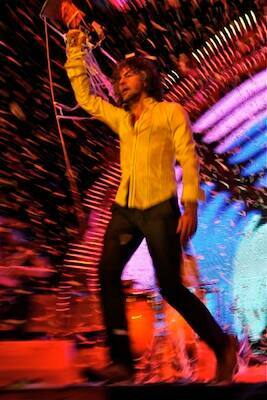 The show started with a 5-story glowing crotch that inevitably became the door the Flaming Lips entered the stage from. They wasted no time to set ablaze the half-filled Molson Amphitheatre last night in Toronto with psychedelic screens, confetti canons and of course those signature big balloons bouncing through the crowd. 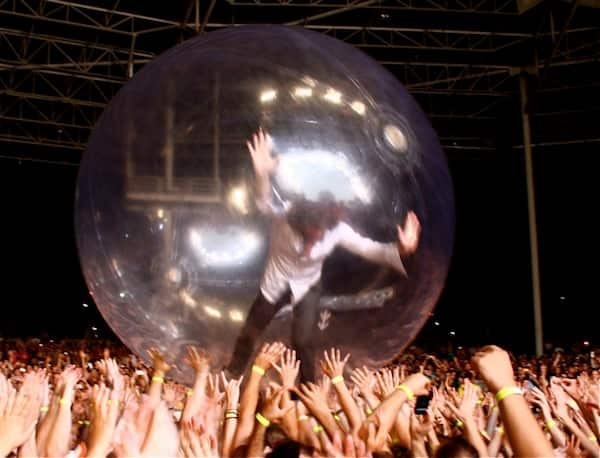 Before 'Worm Mountain' the wild and wondrous Wayne Coyne surfed the crowd in his "space bubble" as the guy behind me mentioned "this is what we come for (the show), the music is incidental". But oh contraire mon frere, the music is amazing, though at times overshadowed by the antics. 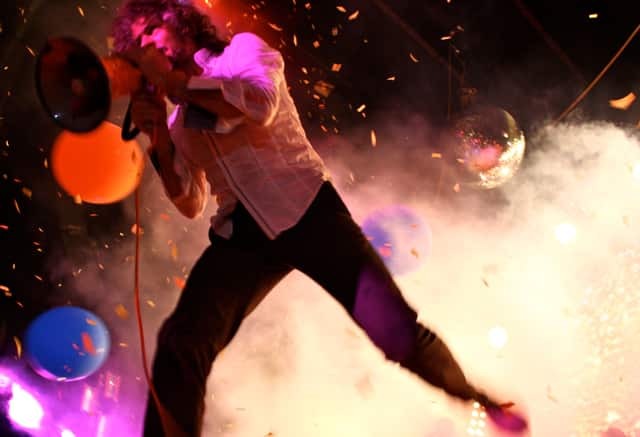 They had an orange cubic stage with orange people this time, Coyne's face screen wide from the camera on his mic and a lot of fun and frolicky things flying out in the crowd for what Wayne Coyne calls the "enthusiastic joy of life!" But the music is not to be underestimated, from Floyd-like dream trance to driving galloping beats and thunderous guitar rifts there is some amazing music in there... and all with the fun of the Violent Femmes. Did I mention, they also just recorded their own version of Pink Floyd's 'Dark Side of the Moon'. As much as they are about childlike fun and adultlike wildness, they are also intelligent and politically conscious. Before the 'Yeah Yeah Yeah' song, Coyne told us he wrote that out of the frustration of having Bush as President, but said for every one time hate he has for the former President, he has 20 times support for Obama. I didn't realize just how great this band actually is so be sure to give them a listen. And definitely try to catch a show, that's an experience all its own, that is sure to make almost anyone smile!